The US Department of Energy’s Pacific Northwest National Laboratory (PNNL) has developed a continuous chemical process that produces useful crude oil with harvested algae. 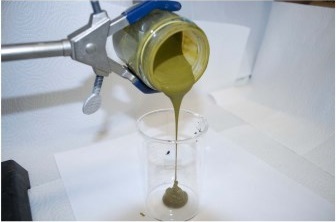 According to PNNL, a slurry of wet algae, in this case verdant green paste with the consistency of pea soup, is being pumped into the front end of a chemical reactor. Once the system is up and running, crude oils are produced in less than an hour, along with water and a byproduct stream of material containing phosphorus that can be recycled to grow more algae. With additional conventional refining, the crude algae oil is converted into aviation fuel, gasoline or diesel fuel. And the waste water is processed further, yielding burnable gas and substances like potassium and nitrogen, which, along with the cleansed water, can also be recycled for algae growth. The team reported that in experiments generally more than 50% of the algae’s carbon is converted to energy in crude oil, sometimes as much as 70%. PNNL simplified the production of crude oil from algae by combining several chemical steps into one continuous process. The most important cost-saving step is that the process works with wet algae. According to the report, most current processes require the algae to be dried, which take a lot of energy and is expensive. The new process works with an algae slurry that contains as much as 80-90% water. 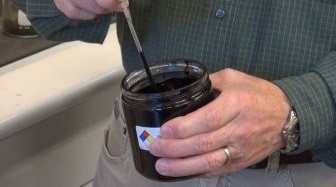 The PNNL system also eliminates another step required in today’s most common algae-processing method: the need for complex processing with solvents like hexane to extract the energy-rich oils from the rest of the algae. A biofuels company, Genifuel Corp, which has worked with Mr. Elliott’s team since 2008, licensed the technology and is working with an industrial partner to build a pilot plant using the technology. “This has really been a fruitful collaboration for both Genifuel and PNNL,” said James Oyler, President of Genifuel. “The hydrothermal liquefaction process that PNNL developed for biomass makes the conversion of algae to biofuel much more economical.”The result of this research was reported recently in the journal Algal Research.